Buying a laptop doesn’t have to take months and months of research. There are a small number of things to look for to find a good affordable model that works for you. The biggest thing you have to know before you even start looking is what are you going to use it for? Are you looking for a new work laptop? Gaming laptop? College laptop? If you want to be wise with your purchase then this is the question you have to answer first. Most people focus on what looks better or what is popular at the time (MacBooks everywhere). Finding a good laptop doesn’t have to cost you an arm and a leg. In a previous post, we talked about the smartphone upgrade dilemma. This isn’t really an issue with laptops because you usually buy them with the intent of having them for more than 4 years. But how to choose the right one? Read on to find out. Mac OS or Windows? The never-ending battle. Honestly, this comes down to what would be more convenient for you. Macs have always been great for graphic designers and video editors. Windows are very versatile and are pretty much the standard in the work industry. This is where knowing what you’re using it for comes into play. The norm now seems to be 2-in-1 laptops that work as both laptops and tablets. These are great if you are always on the go. Most people have left the idea of having desktops behind and work solely on laptops and tablets. They are compact, light, and easy to work with. How active are you? Do you visit clients often? Then a 2-in-1 might be the best option for you. The last time I trusted buying a laptop online without trying it out first was a nightmare. I couldn’t stand the noise the mouse button on the trackpad made. Just one sound ruined my experience with the laptop. Learn from my mistake. Try to find an in-store model of the laptop you are looking for to see if you like the design and feel. 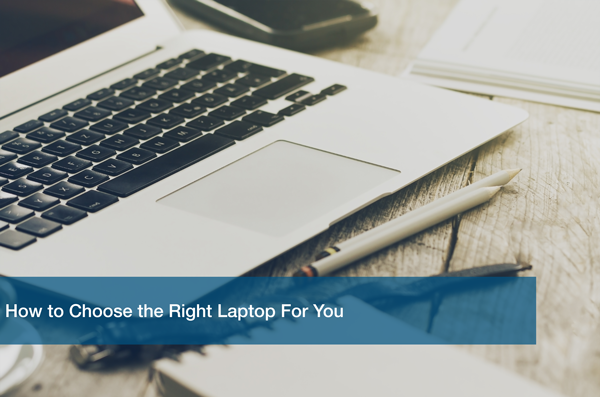 From the type of keys to the actual feel of the laptop, it doesn’t hurt to try it out before purchasing. The main thing people look at are the specs. How much memory does it have? Can you upgrade it? Screen size? Weight? These are all very important factors. Luckily there are many articles online that compare specs from many different laptops. They have essentially done the work for you. Youtube is also filled with reviews for many different brands so you can see them in action before committing. There are other things that come into play when buying a laptop. These are just some for you to consider. If you’re still unsure, schedule a free IT analysis with one of our experts and they’ll be happy to help you find the right equipment to fit your lifestyle. We’ll even help you set it up! Call or visit us today. We support your technology so you can focus on your business.